You know what’s really missing from your $35,000 Tesla Model 3? More video games. In a followup reply, Musk also admitted that Nintendo wouldn’t license the blockbuster “Mario Kart” to Tesla. That’s not surprising, given how cagey Nintendo has been about its own intellectual properties — but it is a shame. Playing “Mario Kart” on the Model 3’s 15 inch touchscreen sounds pretty fun. But it would take quite a bit of work on the software front — that is, if Tesla’s board computer is even capable of handling complex 3D animation on the fly. And that’s not to mention the complete lack of a controller. There are already other ways to play games in a Tesla. 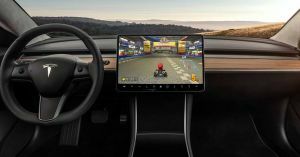 So far, Tesla has included easter egg features like “TeslAtari” — an emulator of classic Atari games from 1979 with touchscreen controls — in all of its cars. But Musk’s strange obsession with bringing video games and other fun to Tesla’s electric vehicles makes sense: once cars are able to drive themselves, what will we be left to do while while they drive us around? Sure, we could mess around on our smartphones or read a book — but honestly, video games on the dashboard monitor sounds like a lot more fun.